written by Felicity McWilliams, Project Officer for A Sense of Place, Countryside21, and Reading Connections. ‘Focus on Collections’ will be a regular feature examining our staff’s favourite objects in the museum, as well as anything interesting we find during research. 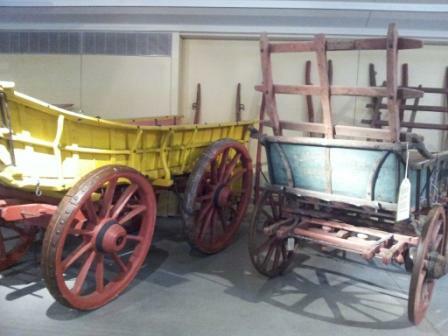 Visitors to MERL will know that the wagons form a large part of the current displays in the gallery. Many are grouped around the wood and metal sections, but they are all over the gallery, most noticeably high up on the ‘rails’. They are a hugely important part of the collections, so they will of course feature in the redisplay (not to mention the fact that, given that they’re so big, there’s a limit on choices of where to put them). The plan for the new galleries will involve a way to highlight these wonderful vehicles more, and some of the wagons might soon be on the move to the proposed extension out at the far end of the gallery. Grouping some of them together in this way may allow different stories to be told, such as the regional variation and adaptation to local landscapes evident in wagon design. Given that I have been working on the A Sense of Place project, one of my favourite things about the wagons is how you can see the effects of place and landscape on their design. Stand between the Cornish wagon and Shropshire wagon in the gallery and you will start to see what I mean. The Cornish wagon is much smaller in scale, has small narrow hoop-tyred wheels, tall ladders and rope rollers at the back. These features make it perfect for the Cornish landscape – a small wagon for the narrow country lanes, and tall ladders and rope rollers to secure the load because the lanes are often steep. The Shropshire wagon (MERL 59/219) on the left, in contrast to the Cornish wagon (MERL 62/530) on the right. The Shropshire wagon looks almost comically large in contrast, and is painted bright yellow (which is apparently traditional for Shropshire wagons, though I’ve yet to be able to find out why). It has very wide strake-tyred wheels, with two rows of strakes. Hoop tyres, as on the Cornish wagon, are formed of a continuous hoop of iron, put onto the wheel when hot so that it shrinks and secures the rest of the wheel’s components tightly together. A straked wheel, in contrast, has numerous arched ‘shoes’, called strakes, nailed around its rim. Because these don’t shrink onto the wheel in the same way, a tool called a ‘samson’ is used to pull the rim sections tightly together before each strake is nailed into place. The museum has a samson, which you can see in the display case of wheelwrighting tools not far from the Shropshire wagon. The two rows of protruding nail heads on the wagon’s wheels provide crucial extra grip for the wet, clay-like soil in Shropshire. If you go to the Museum’s online catalogue, you can find the records for the Cornish and Shropshire wagons, as well as all the other wagons on display. These records were ‘enhanced’ as part of the A Sense of Place project, and it’s great to think that some of the work from that project might be feeding into the changes happening at MERL over the next few years. This entry was posted in Focus on Collections and tagged A Sense of Place, MERL, Our Country Lives, wagon. Bookmark the permalink.